Ok, let’s get right to it. 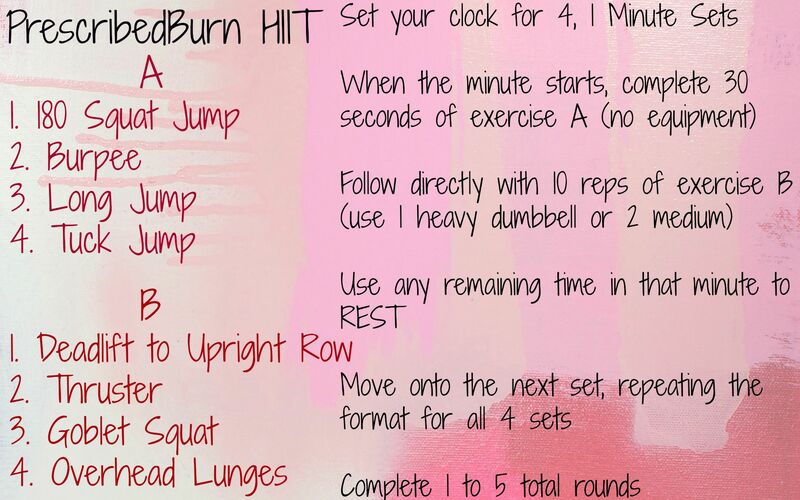 Here is today’s new HIIT workout. First, depending on what equipment you have available or what you feel comfortable using, you will need a single heavy dumbbell or can substitute with 2 moderate- to light-weight dumbbells. Modify the weight to suit you! Then, set your timer (or just get a clock with a second hand) for 4, 1-minute sets. The rest is built-in so you don’t need to set separate rest periods. Any time you have remaining in your minute is REST. 30 seconds 180 Jump Squat then 10 reps of Deadlift to Upright Row. Rest until 1 minute hits. 30 seconds Burpee then 10 reps of Thrusters. Rest until 2 minutes. You can complete anywhere from 1 full round (4 minutes) to 5 full rounds (20+ minutes). I recommend 1 – 2 minutes rest between each round. Let me know how it goes. If you are confused, leave a comment and I will answer. I am working on getting an exercise index up, that will include pictures, videos and demos! Previous Post Back to Work!